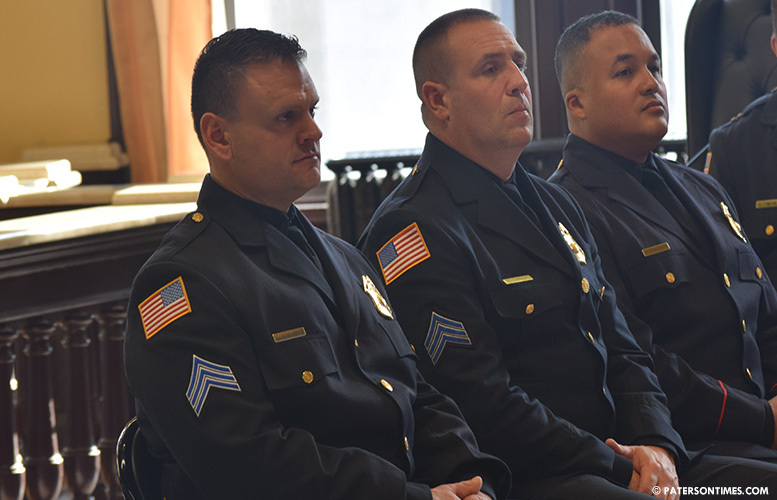 Three police officers were made sergeants and a fourth made lieutenant during a ceremony at City Hall on Wednesday afternoon. Police sergeant Stephen Iacuzzo was promoted to the rank of lieutenant and officers Christopher Benevento, Edgar Taylor, and Eric Montoya were moved up to the title of sergeant. “This is a day each of you have earned,” said police director Jerry Speziale. Promoted sergeants Christopher Benevento (left), Edgar Taylor (center), and Eric Montoya (right). Iacuzzo has been with the department for 18 years. Benevento, Taylor, and Montoya have been with the city for 14 years. Speziale gave the promoted officers, who have been with the department for more than a decade, advice on leading men and women under their charge. Speziale said the new promotions are filling vacancies. He said the promotions are needed for the class of 25 new police officers who will join the department in January. 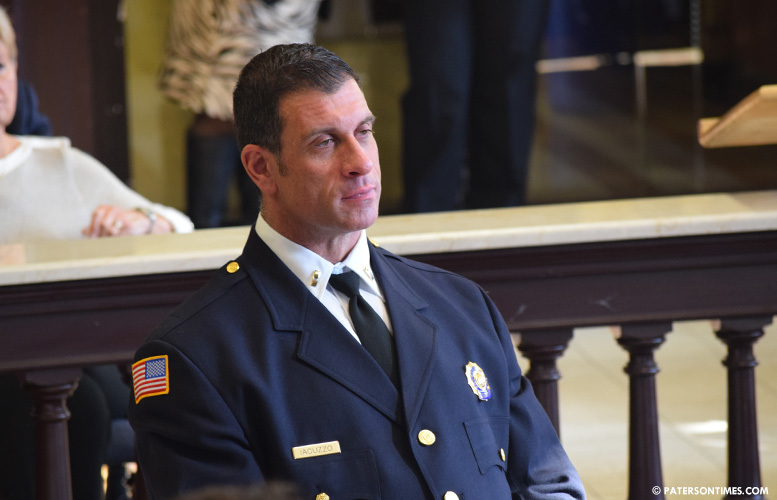 Newly minted lieutenant Stephen Iacuzzo. “You’re making the leap to roles of greater responsibility and authority to serve your community. You will be required to perform the duties with honor, respect, and dignity,” said deputy police chief Ibrahim “Mike” Baycora. Council president Ruby Cotton urged the promoted officers to play active roles in the neighborhoods. “We need you to be part of our community,” said Cotton. She also told them to have compassion when dealing with residents. “The people that you are promoting are good, hardworking people,” said deputy police chief Troy Oswald. Oswald provided brief descriptions of the work each of the four men have done over the decade. For example, Iacuzzo worked in the Major Crimes Unit for the past decade. “Solved a lot of homicide there?” remarked Oswald. “Yes,” replied Iacuzzo. He is now in the Internal Affairs which investigates complaints against police officers. Benevento worked out of the police radio room. Few times a month, he spends his own money to purchase things for the radio room that suffers from breakdowns. Oswald said Benevento is a police officer, who goes to the store with his own money, to purchase things like cords and other equipment to restore the phone system following a breakdown. Oswald highlighted the dedication of the officers. For half-decade, Taylor worked within the Ceasefire Unit solving non-fatal shootings. The Ceasefire Unit is renowned for speedily solving non-fatal shootings in the city. Montoya has been targeting troublesome liquor establishments for the past three years. He is the department’s sole liquor law enforcer. His investigations have led to suspensions of a number of troubled liquor businesses over the years. “They exemplify what our police department should be,” said mayor Jane Williams-Warren prior to administering oath to the four promoted officers.